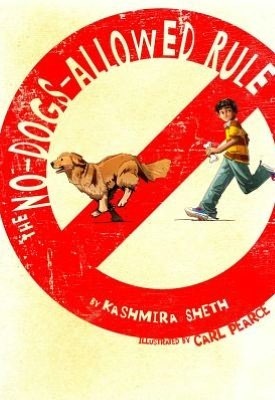 The Book Rat: Giveaway: The No-Dogs-Allowed Rule by Kashmira Sheth | Summer Book Giveaway bash! Giveaway: The No-Dogs-Allowed Rule by Kashmira Sheth | Summer Book Giveaway bash! The folks at Albert Whitman & Company came home from ALA to find they had a bit of a problem on their hands - they had dozens of signed kids books and no new kids to read them and love them! So they decide to have a little Signed Summer Book Giveaway, and (lucky you!) that means you've got chances to win some of them! Ishan Mehra wants a dog, but his mother has a rule about dogs. (Guess what it is?) Ishan figures if he's helpful enough and does enough things right around the house, he can change her mind. Somehow, though, the right things seem to come out all wrong. whether it's making paratha for breakfast or repainting the hallway! Award-winning author Kashmira Sheth's first novel for younger readers introduces Ishan, whose hilarious misadventures will resonate with kids everywhere. As part of their Signed Summer Book Giveaway, Albert Whitman & Co. are sponsoring numerous giveaways all across the blogosphere! By entering the Rafflecopter below, you can enter to win The No-Dogs-Allowed Rule, but there are plenty more great signed kids, middle grade and teen books up for grabs! Make sure to stop by and check them all out! Ends August 11th at 12am EST. US and CAN only. This would be great for my avid reader. He usually likes to read a book in bed before he goes to sleep. Would love to add this to my elementary school library shelves! My students love dog stories of every sort - but especially the ones where the parents disapprove and the kids have to win them over. I have grades preK - 5th at my school and they all come in the library asking for dog books. I know my middle grade students would love this! I love to get books for my granddaughters it helps keep them reading, saves momma's some money they can use for other stuff, plus I am a firm believer that reading broadens knowledge, and interests in life. My daughters love to read and so do I! Hopefully we can read and enjoy this together! Sounds like something my daughter would enjoy. Thanks for the giveaway chance. Thank you for this giveaway! This is something that I would love to have for my classroom library.